Here’s an update on how different tax software handle the issue of self-employed health insurance deduction and the premium tax credit under the Affordable Care Act. I was hoping that tax software would just take care of this, because tedious calculations with paper and pencil takes less than a second on a computer. By now tax software vendors all had their opportunity to issue updates to their software. Let’s see how they do on this task. I used Example 2 in IRS Rev Proc 2014-41 as the benchmark. It’s a very straight forward case. In 2014 a self-employed person bought the second lowest cost silver plan for her family of four from the exchange for $14,000 a year. She did not request any advance credit. Her income before considering the self-employed health insurance deduction was $82,425. The question is how much of the $14,000 she can take as a deduction and how much she can take as a credit. H&R Block software basically gave up on this. If you go ahead and file anyway, your return will be wrong. It puts the entire $14,000 as a deduction, and it claims $7,678 as the premium tax credit, both of which are larger than you are allowed to take, making you underpay your taxes to the tune of $2,000. No doubt the IRS will have a serious issue with that. Not supported in the program. Must pay extra $50 to work with a H&R Block professional. I then turned to TaxACT because you can get a free download of the federal return program with no strings attached. If I’m going to file with TaxACT I will pay for the Deluxe edition, but for testing purpose I’m OK with the free program. Surprisingly the free TaxACT did the job very well. It calculated the right split between the self-employed health insurance deduction and the premium tax credit. The deduction is now $7,147, not $14,000. The IRS had the correct credit as $6,849 in its example. TaxACT had it as $6,853 due to rounding. I also tested TurboTax Online. I had to upgrade to TurboTax Home & Business for self-employment income. I did not enter health insurance premium as a business expense in the business section. There was a separate section for Health Insurance under Personal. After entering the same 1095-A information, I checked a box to indicate that the health insurance was related to self-employment. This was the same number TaxACT got, off by a few dollars from what the IRS had in the example due to rounding. Conclusion: The least expensive (free) edition of TaxACT handled the circular calculations easily. TurboTax Online also did it successfully but you have to upgrade to the more expensive Home & Business edition. H&R Block software gave up without trying in the 2014 edition (its 2016 Deluxe edition makes the correct calculation). Can anyone from HR Block comment if there will be an update to address this issue? Today I was referred to online help by their call center, when I asked about this problem. Then my PC sat on the H&R Chat page for 3 1/2 hours waiting for an agent to log on and take my question, polite messages about “your patience is appreciated” scrolling across the screen from time to time. Eventually I gave up. I think they are just pulling their heads in, and hoping it goes away. It’s kind of like if you buy a bus ticket to Chicago, and they dump you in the middle of Cleveland and say, the train station is over there. And you get there, and nobody comes to the door to open it. Looks like Tax ACT will get my business. I’ve used TaxAct for years and had have always been satisfied. Every year toward fall they send out an email with a great renewal rate for their premium product. I believe this year I paid just $15 for Federal and State electronic filing. I used the H&R Block online software and didn’t get the inconsistency warning. I did have marketplace insurance and a self-employed health insurance deduction so I hope they got it right. Maybe you aren’t eligible for the premium tax credit? I just checked H&R Block Online with the same example. Same thing there. Can’t do it. It asked me to upgrade to “Best of Both” and work with a H&R Block professional. I added screenshots to the article. Earlier this season, I found another instance where H&R Block just gives up and tells you to figure something yourself, whereas TurboTax does it for you. I actually tried both products this year, since Block provided a free trial for customers of TurboTax. You run into this situation early in the process of the interview, if you paid AMT the previous year. You are asked whether you want to recalculate last year’s tax in case there would be some savings by doing so. When I chose “yes,” Block just told me to do it myself. Which would be an awful task. (I’m not sure if the same nuisance would arise for everyone — in my case I did my taxes the previous year with TurboTax, and imported last year’s filing into Block this year, at the beginning of the project, and I’m using the Mac version of the software.) TurboTax happily did it for me. That’s cutting corners. One can argue it keeps the cost low for the vast majority of users who don’t run into these corner cases. It would be nice if they say up front which corners are cut. I had this exact same AMT situation (due to going FI), and greatly appreciated that Turbo did this calculation for me. Saved me significant time, effort, and dollars (several thousand). TaxAct worked for me for this year and in the past and is cheaper than alternatives. I use preview version download in October to pre-plan year end which others don’t offer. They also had the PTC calcs working earlier than others for self-employed. Can’t say if any program will work for everyone as some people have complex situations or changes during the year. Only complaint on TaxAct is Form 1095-A rounds monthly amounts which makes totals different from IRS form. It shorted my tax credit amount so I did override on annual totals and mailed instead of efilie – total cost was only USPS postage. I attempted to use HR Block “premium”. I did not know about this self-employed/marketplace problem until now [great article, by the way]. I got the “give up” message described by Harry Sit above. The software then directed me to a local HRB office, which I visited today. They explained that: 1) they know nothing about the HRB software, and 2) they can do the return, but it would cost around $200-300, since we have some (simple) investments. So: 1) HRB dropped the ball on the software — i.e., they refused to pick up their responsibility to either do this or explain in big print that they refuse, and 2) they point you to alleged HRB tax personnel who apparently are HRB only in name. I am going to look at Tax Act *tonight*. by the way — Nicholas B — I wondered how long it would take. I waited on their support line for 60 minutes x 2 [had to leave]. No luck. Reached no one at all. Interestingly, the web page message about how long the wait was likely to be was: 1) 27 minutes, and 2) zero minutes. So apparently they can’t program web sites either. [Yes, I’m quite annoyed]. Nice to know what would have happened if I had tried going to an H&R Block office- thanks. I was able to leave my laptop sitting waiting for an agent to chat on their site, while I did other office tasks. The message that I was #17 in line , thanks for your patience, etc was reduced to; thanks for your patience an agent will be with you in moment, when I reached #10 in about 1 hr. Then it just stayed there, repeating every few minutes, until at about 3 1/2 hrs I really had to leave. I’d jumped to H&R Block from TurboTax this year when I found Intuit had made it impossible to do a Schedule C on anything but their most expensive software, which made something of a splash in the news ( not surprising, as anyone who’s used Quickbooks will tell you about how Intuit is constantly finding mandatory fees and services it can put between you and your use of their products). H&R Block must have gotten a lot of Schedule C filers jumping from Intuit, and a lot of them must have jammed into the chat rooms. I wonder if any of them got any joy? I wonder if H&R Block will get any of us ever wanting to come back? It’s like having to choose between hiring a con man and a screwup. At least now I know I have a year to figure out what TaxAct will be like. Anyone know of an online calculator yet? I’m working my own out but would like a check. You can just download the free TaxACT. Free taxact would require I input all my other details as well right? I’ve already filled out my return but need to amend slightly for this nonsense. That would be very time consuming. Just found this Google spreadsheet by Richard. It’s read-only on Google. You need to download it (File -> Download As …) before changing the numbers to your own. I ran the same Example 2 in this article. The spreadsheet gave the correct numbers. They also confirmed that TurboTax does the calculations correctly. NONE of which match the IRS calculation of $6,853. Because the $82,425 is after one half of SE tax, you have to use $88,691 as the Schedule C income. Example 2 has $14,000 as both the premiums paid and the SLCSP. Make sure you change the “applicable figure” numbers on Richard’s spreadsheet. It doesn’t automatically look up from the large table below. Thanks so much for explaining that I needed to enter $88,691 in Schedule C income and an SLCSP of $14,000. After doing so, both TurboTax (which is what I’m actually using to file) and Richard’s spreadsheet came up with the correct numbers (credit: ~$6,850; deduction: ~$7,150). I then changed the SLCSP on both TurboTax and Richard’s spreadsheet to $15,372 and they again agreed (credit: ~$8,100; deduction: ~$5,900). One thing that still puzzles me: The Example 2 from the IRS states: “B … has household income … of $82,425, which includes $75,000 of earned income (within the meaning of § 401(c)) derived by B from the trade or business with respect to which the health insurance is established.” Where does the difference between $82,425 and $75,000 play a role in your / Richard’s calculations? Is it relevant? It’s not relevant. If you use $75,000 as the Schedule C income, after calculating 1/2 of the SE tax, you then need to plug in some other income to make the household income $82,425. You will get the same result. I’m told by our digital products team that we will be supporting self-employment health insurance (SEHI) and ACA Premium Tax Credit (PTC) for the most common cases in both this online and desktop products this year. I am self employed; and had to pay a $1500 payment to the IRS last year for an overpayment of my health insurance tax subsidy. Since that should have really been paid as a health insurance premium (guestimated my 2014 income incorrectly); can a self-employed person also deduct the over payment amount ($1500)? That is a really good question. I am also self-employed and I didn’t owe anything on the advance premium tax credit for 2014, but I don’t know yet what will happen with 2015 APTC as I haven’t done my taxes for that year yet. Would be interested in the answer if anyone knows. If you went through this exercise last year for your 2014 return, the $1,500 was part of the premium you were responsible for in 2014. It was already deducted last year on the 2014 return. But for the self-employed health insurance deduction (on p. 1 of the 1040, “adjustments to income”), aren’t you only allowed to take off what you actually paid for insurance premiums? Which would be the stated premium minus the APTC — and then if your tax calculations determined that you should have gotten less APTC, in other words, you now owe that amount back, wouldn’t that also be considered as money that you would have paid for your health insurance premiums? Or, are you supposed to put the stated amount of the premium, before APTC, in the self-employed health insurance deduction line? This is making me dizzy, and I was a math major in college! That’s why you need software. It calculates what should be put down as your deduction (not just what you actually paid in 2014). Teresa B. – It’s the first scenario you’ve described. 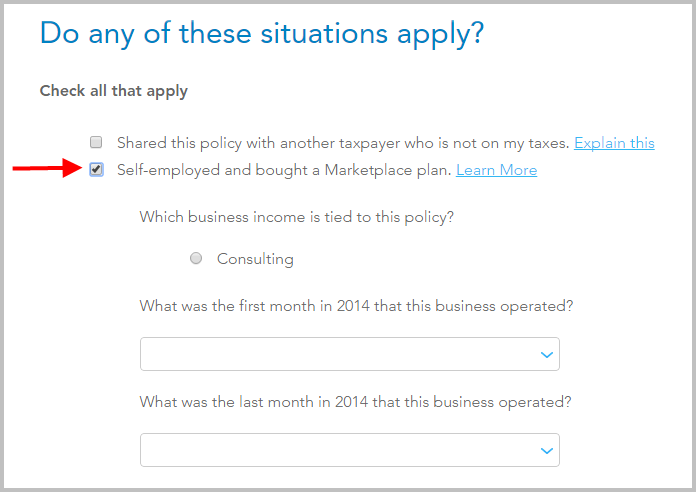 But here is my question: TurboTax in 2014 handles it different in 2015. In 2014 it was either you got the PTC or took the deduction, which does not make sense. For 2015, whatever you actually paid (full premium – the APTC) gets applied as the a deduction, which does make sense. So does this mean I can file an amended return for 2014 and claim a deduction for the part of the premiums I did pay? Or did something actually change in the Tax code between 2014 and 2015 and now this is allowed and in 2014 it was not? Thank you… That was more what I was asking in my original question. The repayment of the subsidy is actually premium … Maybe self-employed should put the full premium as the deduction? No. Read this article and the ones it references. The software will calculate the actual tax credit you are eligible for. The remainder is your deduction. The repayment of the advance credit after the actual credit for 2014 is determined in 2015 is deducted on the 2014 tax return. You don’t deduct it again in 2015. Harry, I am not sure you are understanding the situation, maybe? The $1500 is never accounted for in 2014 or 2015. I didn’t use tax software in 2015. In 2014, the amount of the deduction that I took for self-employed insurance was the amount of the premium less the subsidy. My income was greater than I estimated, so that when the taxes were filed, it showed I owed part of that subsidy back. In paying the $1500 back, I’ve essentially paid a health insurance premium in 2015 for 2014. I do understand the article…and the redundancy of self employment income, less health insurance deduction, and magi. But, I do not understand where you are saying the $1500 payback was ever accounted for? You should’ve used software for 2014. It would calculate the deduction and credit correctly and take care of the $1,500. It’s not too late now. You can find software or knowledgable person to amend your 2014 return. My understanding is that you are correct, the additional $1500 you had to pay does count as SE Health insurance. See Rev Proc 2014-41 example 1, step 1 where it does exactly that. (So you know, in the example, code section 162 is SE Health Ins). Your deduction is the amount you actually paid out of pocket after the advance credit plus whatever you had to pay back. Even though you didn’t pay the additional $1500 until 2015, the deduction is for 2014 so you would need to amend that return. Actually, you know, since you are cash basis I think there is a really good basis to argue that the $1500 should be deducted in 2015. I bet that issue does get challenged. That however, would further complicate 2015’s calculation. The unintended complications that arise when congress adjusts the tax code are amazing. Anyway, your logic is sound and you are on the right track. PS. My software has trouble with this calculation and its a professional version used by thousands of CPA’s and Tax Professionals. The IRS laid out the calculation procedure. You have to follow it, whether with software or with paper and pencil. You can’t deduct something in 2015 only because you didn’t follow the procedure in 2014. Um I think I said she should amend 2014. Its by far the easiest, most practical thing to do. I was musing that her argument makes sense for a cash basis taxpayer. And no one “has to follow” the IRS if you have a basis for thinking they are wrong. You can challenge. It happens all the time. Half of our tax laws are based on court cases determining questions like this. Her argument is that since she paid it in calendar year 2015, it isn’t consistent with the rest of the code to deduct it in 2014. That position has merit imho. Just because “the IRS says” doesn’t mean they are right. I think its possible the IRS could concede or failing that, I can see a court agreeing with her position. Fine if you don’t. I agree with the advice to use tax software for this. It’s a complicated calculation for those of us who use the self-employed premium deduction AND the APTC, because it’s recursive. For my 2014 tax return, I first used HR Block’s home & business edition (forget the exact name of it), which I’ve used for years. However, I ran into the problem described at the top of this discussion, in which the HR Block program couldn’t handle both the self-employed health insurance deduction and the APTC, and advised users to go to an HR Block office to finish their taxes! That brought me to this blog and after reading the tests that were done on the various tax programs, I decided to use TurboTax (home & business, which I need because I have to issue 1099s for my subcontractors), which worked fine. So, yes, I agree that it’s definitely better to use the software for this situation, as long as it works! I know I’ll never use HR Block again. Using TurboTax again this year. I’m definitely having an accountant do my taxes this year….but, no one seems to have a solid answer on what to do with that $1500 health insurance payment. SO…maybe I will need to call the IRS? Just make sure that the accountant that you hire knows how to deal with this. In my experience, even the best tax accountants can miss things, if it is outside of their expertise and the bulk of the work they do — if most of their clientele is different from your situation. It took my husband and me three tries before we found a decent tax accountant in the big city where we used to live, who knew how to do taxes for self-employed people. After moving to another region, I learned how to do it myself and later trained to be a tax preparer at a national chain’s local tax office. A tax preparer does not get a whole lot of training, 12 weeks at this company, which is fine for the typical storefront tax office. An accountant is much more educated, but again, if they don’t know how to deal with your particular tax situation, that education won’t help you. Teresa – I have the same situation as you do. What I found is TurboTax Deluxe for tax year 2015 handles it correctly as far as I can tell. I did not even use the Home and Business edition. Then when I transferred the values from the 1095-A form I was sent, TurboTax automatically included the amount of (premium – APTC) as a business expense for my self-employment earnings and on line 29 of form 1040 (self-employment health deduction) thereby reducing my AGI. But it gets even better than that: since I made a bit more than I estimated for calculating the APTC, I have to pay some of that back and that amount is also included in what is entered on line 29. It looks like the amounts match up dollar for dollar, so there is nothing mysterious going on – just basic math. As far I can tell it all self-levels all within a given tax year. Even if you owe because you got too much APTC, you get that back in the form of a deduction. That all said; I don’t think the tax code changed between 2014 and 2015 – instead it looks like TurboTax is simply pushing the issue and ultimately the IRS needs to make the call on this. If it turns out the way its being handled in 2015 is correct I will amend my 2014 return to claim that deduction. Steve H., Thanks for the detailed reply. I’ll have to check out my 2014 calculations to make sure that TurboTax took enough of my self-employment health ins. deduction. Here’s a tip for anyone who is underestimated their income and finds that they owe something back for the APTC: if you do your taxes before April 15, you have time to make an IRA contribution if you haven’t already, and have it apply to the previous tax year. This is a great way to save for retirement while also reducing MAGI. That payback amount might disappear after putting in the deduction for IRA contribution. Just be sure to tell the bank that the contribution is for the previous year and double-check the forms before signing. Mark, I sure appreciate you at least recognizing my thought process on this. I do understand that amending my 2014 return would be easiest thing to do. However, as a non-accountant person…I do feel like I could make a legit case for claiming in 2015. I think some of my accounting friends find it odd that I don’t feel like the IRS is a very organized, timely or responsive organization. I do not cheat, I pay a large (and fair) tax bill….my goal though, is not to pay more than I should. The ultra wealthy have figured this out. Anyway, i appreciate your feedback! I needed just a little confirmation that my thought process wasn’t crazy. Besides, all of this is so new…2014 was a disaster in healthcare tax penalties, reporting and under/over payments. Hello! Hope someone can help me with the Premium Tax Credit. I used HR Block Software last year and of course had a terrible time calculating insurance deduction. So my questions is if you use your Premium Tax Credit throughout the year, can you still use what you pay for insurance as a deduction. For example if your insurance premium is $12,000 and you received a $6050 tax credit to pay premium but pay $5950 out of pocket. Is the $5950 your deduction? Also, does anyone know of the best software to use for 2106 taxes for the PTC and small business? Thanks for any information or input! It’s more complicated than just taking the amount after the advance credit as a deduction. You should use software. Either TurboTax or TaxACT will work. Can you please explain how it is more complicated? See IRS Guidance On Circular Reference in Obamacare Premium Subsidy and Deduction. I just tried this in H&R Block Deluxe 2016 desktop software. It correctly calculated the premium deduction and the tax credit. I’m having problems with the online H&R Block version. I get a PTC tax credit, but the amount of dental insurance over and above what shows on 1095A will not appear on line 29. In the desktop version, under Federal -> Adjustments -> Self-employment Health Insurance, enter the *full annual premium* before any advanced credit as the premiums paid. In your case include dental there. See if you can do the same in the online version. Hello – does anyone know of software that will correctly calculate this when you also have a student loan interest deduction? Thanks! I don’t know for sure, but I don’t see why TurboTax wouldn’t be able to handle that. Student loan interest is one of the adjustments to income on p. 1 Of the 1040, and it will help to reduce your AGI and hence your MAGI, which is used for calculating the premium credit and CSR. Most everything in the adjustments to income list is fairly simple and straightforward, with the exception of the self-employed insurance premium deduction, which as discussed here, TurboTax can handle. Great, thanks! Last year, when I had to do it all manually, it was one of the deductions on the “special circumstances” list in the IRS instructions, and that added another worksheet and another round of going through the circle again and recalculating everything. I cannot recall the reason why it mattered right now, what effect it had on the outcome, but it sure was cumbersome. Just don’t want to purchase software if I’m going to have to end up doing all by hand anyway! Thanks. I spoke to Stephen J. Toomey at the IRS on the phone; he says this is the only calculator known to the IRS which always gives a consistent and accurate calculation of the premium tax credit for self-employed people. Turbo Tax software does not always give the right amount. Thank you for putting up a better calculator. Under what scenario does TurboTax not give the right amount? Is the problem limited to TurboTax? Can you give a classic test case to validate other software and any future fix by TurboTax? -There are, roughly speaking, four types of scenarios when TurboTax does not give the right amount for the premium tax credit. I will discuss these below. -The problem is not limited to TurboTax, but affects every tax software known to me. This is because the problem does not originate with the software, but with the IRS guidance, Rev. Proc. 2014-41. Although the IRS says not to use the method they propose when it doesn’t work, it does not offer alternatives. Unfortunately, commercial tax software tends not to try any method not explicitly offered by IRS guidance, which is perhaps why the TurboTax software, H & R Block, etc., don’t always give the appropriate amount. The IRS says that the method I’ve proposed will be explicitly mentioned in 2019 publications, so that tax software will adopt it and eventually calculate the premium tax credit correctly in general. -Test cases: while I don’t have a classic test case, I do live in NYC and know a few people who are adversely affected, so here are some numbers you could try. Please note that as the expected contribution percentages change each year, along with benchmark insurance costs, the federal poverty line, etc., these numbers may or may not be adversely affected in the future. Example #2: same as above, except earned income = $52,600. -The four scenarios adversely affected: two of the scenarios only affect states which haven’t expanded Medicaid, like Texas, Florida, and South Carolina. So, let’s first focus on the other two. -The first scenario is, roughly speaking, that the MAGI (after using the correct subsidy amount) is 400%. For someone who purchased the second lowest cost silver plan, the band of earned incomes for which this is true (or more precisely MAGIs before you make Line 29 deductions) are those between 4x(1+c)xFPL, where c is the final expected contribution percentage (9.69% for 2017 coverage year), and 4xFPL + unsubsidized health insurance cost, at least if (unsubsidized cost) > 4xcxFPL. The correct subsidy amount in this case is typically the number of dollars needed to raise MAGI (after Line 29 deduction) to 4xFPL, and no more (as that would make them ineligible for any subsidy at all). Example #2 above is like this. -The second scenario is for those whose correct MAGI is “close” to, but below, 4xFPL. Example #1 above is like this. This person receives the whole subsidy amount, so they contribute 9.69% of MAGI and the premium tax credit covers the rest (if they are purchasing the benchmark plan). Unfortunately, TurboTax, etc. tend to give a $0 premium tax credit here. IRS guidance may work for these people, but only if they took premium tax credits in advance that were close enough to the correct premium tax credit. -Third scenario: similar to the first scenario, in a state without Medicaid expansion, if the correct MAGI falls on 133%, where the other subsidy cliff is. There is a whole band of incomes affected here, similar to the first scenario. -Fourth scenario: similar to the second scenario, but with MAGI near 133%. 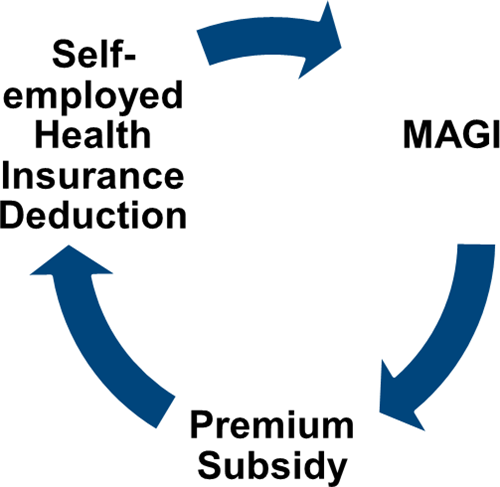 What makes it hard to see which scenario you are in is that, to find MAGI, you need to know your premium tax credit—but you don’t know your premium tax credit. That’s one reason that I developed a premium tax credit calculator that always works, to help the half million or so people affected by the above four scenarios.